Do you want to be sitting in the Barcelona sun, having your breakfast on the generously-sized balcony, with the Sagrada Familia just 10 metres away? 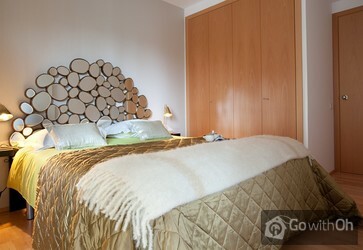 You have found the perfect apartment for your stay- a true one and only in Barcelona! 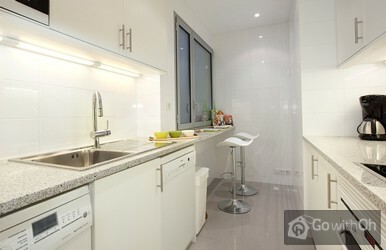 The apartment is newly-built (2010) and has two bedrooms, one with a 1.5m double bed and the other with two twin beds, which can easily be put together. The kitchen offers all imaginable commodities, from a toaster and microwave to a dishwasher, kettle and special pans for making spaghetti. The building has a lift, and the apartment offers hot and cold air-conditioning, enabling you to choose the most comfortable temperature. All bedroom have double-glazed windows- quite uncommon in Barcelona- so that you have a pleasant stay, even during the evening. The apartment is equipped with a large television, DVD-player, Hifi-system, washing-machine and an i-pod station so you can listen to your music, even whilst far from home!Upon arriving home at night, after a full day of discovering the city, you can just relax on the balcony's deckchair and let yourself be seduced by the Sagrada Familia, fully-illuminated and right in front of you. This apartment truly offers you an unbeatable view of the city. We guarantee that you will have a once-in-a-lifetime trip! 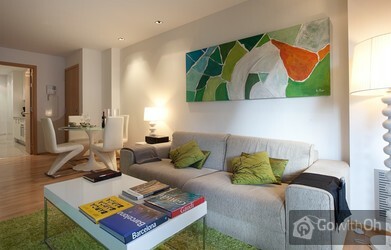 This apartment is located in a prime position as it overlooks the famous Sagrada Familia. You can enjoy the numerous shops, restaurants, bars and supermarkets nearby as well as the many public transport options, such as the Sagrada Familia metro station, on line 2 and 5. However, you can easily walk to the other Modernist buildings such as the Casa Batllo and La Pedrera, also built by Antoni Gaudi. El alojamiento ha sido muy muy agradable, el contacto con la persona ha sido tambien muy bueno, en general muy contentas con todo. le lenzuola non sembravano molto pulite. L'appartamento in generale era molto ben arredato e accogliente. alloggio grazioso,arredato con gusto, tutto molto curato, non mancava niente. Brilliant location, just as described on the web. Improvements could be made in what is provided when you arrive, like a small soap pack, as there was nothing in the bathroom. Loved the place though and would definitely come back again! Wir waren nun das 5. mal in Barcelona und haben bisher schon das 3. mal die Ferienwohnung über oh-barcelona gebucht und sie hat alle unsere Erwartungen übertroffen!Die Lage perfekt genau gegenüber der Sagrada Familia nur 2 Gehminuten zur Metrostation!Netter Nachbarn und hohe Ausstattung der ...Wohnung.Außerdem sehr sauber. Zudem extrem ruhig trotz der zetralen Lage. Wir kommen auf jeden Fall wieder und buchen diese Wohnung. Sehr tolles Apartment - gerne wieder! Jederzeit wieder! Weiter so! lovely stylish apartment. enjoyed staying there an would use again and recommend to others. There should be some hooks for coats. Ubicación estupenda, así como el equipamiento, sin olvidar una estética muy agradable. Eine wirklich wunderschöne, sehr gut ausgestattete Wohnung, an der es absolut nichts auszusetzen gibt. Alles top! Die Wohnung liegt sehr zentral, direkt an der U-Bahn. Zu den Stoßzeiten könnte man sich eventuell durch den Straßenverkehr etwas gestört fühlen, aber da ansonsten alles perfekt ist an der Wohnung, war dies für uns nebensächlich. 9,5/10. Excellente location, avec un appartement en rapport à l'annonce, aussi bien pour l'esthétique, l'agencement que le service. Idéal pour 2 couples. Le fait d'être en face de la Sagrada Familia rend l'endroit très convivial et dépaysant. Le seul bémol est la rue qui reste un peu ...bruyante malgré une très bonne isolation des fenêtres. Le service est vraiment excellent :10/10, que ce soit à la réception (ponctualité, facilité dans les échanges avec lhôtesse qui parlait français, réponse à nos interrogations avant le départ et lors de notre arrivée pour nous faciliter le séjour). Le nettoyage de l'appartement effectué à notre départ par un service indépendant est très appréciable. je recommande vivement ce lieu et le site de oh-barcelona. Die Wohnung entsprach exakt der Darstellung im Internet. Es war superschön die Sagrada zu allen Tageszeiten zu erleben ,besonders auch abends. They looked Just as the picture on your website. We sat on the balcony and watched the construction on the Sagrada Familia. We would definitely book with you again. We have recommended you to friends. Everything was as you said it would be. We arrived early and as prearranged your representative met... us on time. Thank you for allowing us access to the apartment early. Making the booking was easy and your follow-up was excellent. I stayed on the night of a fireworks celebration which went till dawn so it was fairly noisy but hey that's barcelona right! That view out your window made any other small problem irrelevant. Einfach Geniale Wohnung, wenn wieder Barcelona, dann auch wieder diese Wohnung. Netter kompetenter und schneller Service!! Werde "OH" in Zukunft auch bei anderen Städtereisen nutzen. Très bon, personne très compréhensive malgré notre retard. Rapide et sympathique! L'appartement est conforme à la description! Merci pour ce séjour magique Je vous conseil vivement de passer par Oh barcelona! Aucune mauvaise surprise! The apartment is great! Everything is as you can see it in photos. The view is excellent, the location is very convenient! We had a wonderful trip to Barcelona! Great service. I'll promote you to my friends and definitely use again myself. Thank you! 10/10 Super appartement ! A conseiller a tous ! Appartement bien situé et tres agréable a vivre ! Excellent accomodation and location. Friendly and helpful representative, arrived on time for check in. No issues. great modern apartment with world-class view. Easy to travel or walk from location to most attractions. Careful of bag-snatchers in area- we lost a bag as we arrived! Relatively quiet in rooms at night. La personne qui nous a reçu parlait très bien le français, était agréable et nous a fourni beaucoup d'infos : un plaisir! The location was awesome and the apartment tidy and clean. Just as good as I expected after seeing the photos. 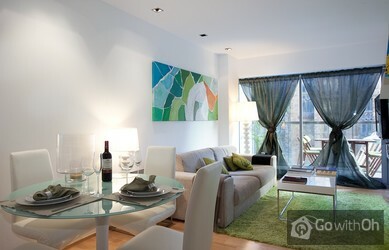 Fabulous Apartment, great location, stunning views,couldnt ask for more for our family holiday! Would use Oh Barcelona again, everyone very helpful. Great service! 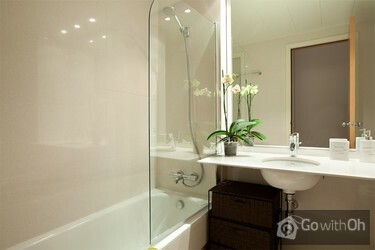 Apartment is great: centrally located, clean and very comfortable. All facilities were in order: we had a problem with internet, but Mark, who was attending to us, fixed it. We really felt really like a home! In fact, it was more than we expected. Todo muy bien. El apartamento era limpio y bien ubicado. Fue una estancia perfecta. Das Appartement hat eine sehr gute Ausstattung. Besonders hervor zu heben sind die sehr guten Matratzen. Sehr zur Abwertung führt jedoch die Tatsache, dass die Metro genau unter dem Appartement hindurch fährt und damit die ganze Nacht quasi durchs Bett. Wer jedoch gut schläft und nicht zu empfindlich ist, für den ist diese Unterkunft Top! Die Wohnung war wunderbar. Wir hatten einen tollen Aufenthalt! Man könnte eventuell den Gästen Basics wie Salz oder Zucker zur Verfügung stellen, aber abgesehen davon war es einfach toll. Muy bien, insonorizado, bien equipado. Podria mejorar la limpieza en la terraza, pero en conjunto muy agradable. Très bonne surprise, à réserver sans hésiter. Alles perfekt - die Wohnung ist sauber, modern eingerichtet und funktionell. Genau wie im Web beschrieben! Extrabonus für das gratis Wifi!! Excellent apartment in a perfect location, the Metro is just a minute walk away and there are many bars and restaurants in the near vicinity to try. It is true you can hear a slight rumble of the Metro in the apartment but this was not a problem for me even though I am a light sleeper. The only ...improvements that could be made to this apartment to make it perfect would be: 1. Black out / thicker curtains in the bedrooms 2. A full length mirror somewhere in the apartment, there is more than enough space and cheap to install. 3. More than 1 toilet roll, 1 dishwasher tablet would be useful. 4. A extra small armchair or bean bag, there were only three of us but if there were 4 there wouldn't be enough room for 4 people on the sofa. WE enjoyed our stay at this apartment immensely. The location was convenient for the Sagrada Familia and metro, the view was spectacular and the apartment was comfortable and beautifully decorated! provide written instructions on how to use the kitchen equipment. We were unfamiliar with the range. The first thing that hits you about this apartment is the view. It is simply amazing! The apartment is small and compact but Having the balcony is a bonus. The contact person didn't offer much information about the area around the appartment. I.e supermarkets/pharmacy/restaurants Etc. it... was dissapointing to then not find a welcome pack with that Information in. As it happened I took ill and we had to find help & a Pharmacy ourselves. The bedrooms had no drawers at all. Not even a shelf in the bedroom Wardrobe - so where do u put underwear? Smaller items? In the master Bedroom there isn't even beside lamps so If one person wants to read the the main lights had to be on!!!???? There was only on one pillow (very soft) For each person. Not enough. Plumbing very noisy! The staff of the company has visited the apartment on the 10th June and the condition was checked. The property owner has arranged all mentioned defects. Apartment was fantastic it was clean and nicely decorated.Good location with two metro stops nearby,area was nice and lively with plenty of cafes and restaurants nearby. Every thing was fine and we had a good time in Barcelone. 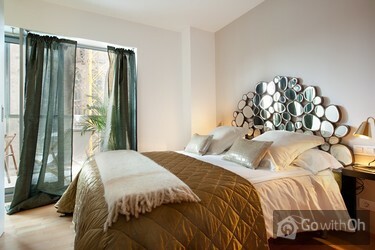 A lovely modern apartment with great facilities & very conveniently located. Most attractions are within easy walking distance or alternatively by Metro lines 2 or 5. There are many convenience stores close by for buying food, but watch out if you arrive late as alcohol is not sold after 11pm. If... you sleep in the front bedroom, bring some earplugs as the builders working on the Sagrada Familia start early! Our contact person S. was in contact via text on the day of our arrival despite being ill and in bed. In her absence, we were met by J, who was very helpful & managed to make himself understood to us despite the language barrier. 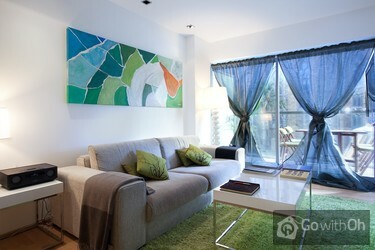 We have no hesitation in recommending this apartment. Thank you for having us! We found the accommodation to be ok, however the kitchen was poorly equipped, the toaster was faulty and when we tried to use it blew the main fuse box and the lamps in the lounge didn't work due to a faulty socket. Great apartment, slightly smaller than the photos suggest but well equipped and really well located for public transport, supermarket, restaurants etc. Nice to have guide books left out to look at. Building work at the Sagrada Familia was quite noisy but closing the windows helped. Fabulous to be so... close, meant we could be in the queue for 9am and beat the crowds. Would definitely recommend the apartment and would stay here again. Solo decir que salimos encantados y habiendo tomado nota para otros posibles viajes. Sin duda lo aconsejaremos a familiares y amigos. Muchas gracias. The office staff was very helpful in contacting one of our party since we arrived late due to canceled flight by American Airlines. Hermoso departamento frente a la Sagrada Familia, muy amable la persona de contacto que nos recibió, tuvimos una muy buena estadía en enero. La calefacción funcionaba bien y el departamento estaba muy bien aislado de los sonidos de la calle y las obras de la basílica. Lo recomendamos!!! Muy contentos del alojamiento.La ubicación, con dos bocas de metro al lado del apartamento, perfecto. Todos los servicios y electrodomésticos del alojamiento a un nivel más que aceptable. Muy recomendable. GRACIAS Y FELICIDADES. Great location, metro line just on the corner, tour bus on another, taxi rank two minutes away. We got the train then the metro from the airport to the apartment and it couldn't have been easier. 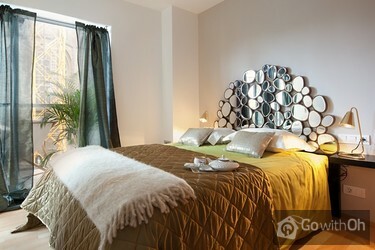 Lovely modern apartment, nice comfy beds, well equipped kitchen and the bonus of wifi. Would certainly... recommend to family and friends. The only quibble I had was our plane was cancelled last minute so we had to get an earlier flight. I texted to ask if we could have access to the apartment earlier or could they recommend somewhere we could leave our bags and I got no reply. This is only a minor fault as it was no hardship for us to hang around in the many nearby bars and restaurants. L'apartment excel.lent :amb totes les comoditats i tecnologies necessàries. El propietari puntual, amable i molt sociable.La ubicació fantàstica. Sols, un però: a la terrassa li fa falta llum per poder sopar allí. Très bonne situation géographique et bien desservie, bonne distribution des pièces de l'appartement et bon équipement (lave vaisselle et lave linge), état de propreté très satisfaisant . Très bon accueil par la personne responsable. Un peu bruyant ( rue et travaux de la Sagrada Familia). Manque de vaisselle de base et d'ustencils. Emplacement parfait et appartement tout à fait conforme à la description. Très bonne isolation et très agréable à vivre . Il y a aussi une petite terrasse donnant dans une cour intérieure qui est très appréciable pour étendre les maillots de bains après la plage . 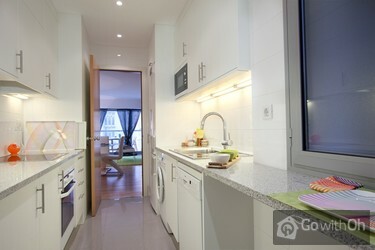 Je recommande vivement ...cet appartement et oh barcelona où le personnel est très pro. Contact rapide et facile. Les infos sont très claires et précises des le départ et pas de surprise une fois sur place. Le fait de pouvoir déposer nos bagages à notre arrivée et en attendant de récupérer l'appartement est un service très appréciable. Un emplacement exceptionnel, dans un quartier agréable et calme le soir. Logement sans surprise, comme sur les photos. Fantastic location. Spotlessly clean. All made very easy Excellent value. Ricordatevi soltanto che durante il giorno c'è il rumore del cantiere della Sagrada Familia (che con le finestre chiuse e l'aria condizionata accesa non è un vero problema), per il resto tutto perfetto. Sotto casa c'è un garage a pagamento per chi arrivasse in macchina, il mercato e più ...supermercati sono a 3 minuti di cammino uscendo in strada sia a dx che a sx. Consigliamo vivamente questo appartamento a tutti!! Noi eravamo li per 12 gg con 2 bambine. la seule chose qui a un peu dérangé, c'est le matelas un peu trop dur du grand lit. The apartment was modern, very clean and more than we expected. The easily negotiated metro was a few steps away. Cafe's, Restaurants, Eateries and Supermarkets were just as close, including Taxi and Bus stands. The view is unique and if you got tired of that and weren't interested in people ...watching, the double glazed windows that shut out the hustle and bustle of the world were excellent. We loved our stay at this modern apartment. Comments are accurate. The apartment is a terrific spot. Highly recommended. Great apartment, we had a wonderful time. muy bien situado, al lado del metro, muy bien cuidado. Vistas excelentes! !Nada malo que decir. Well appointed apartment in an ideal location; with lots of local bars etc and easy access to public transport if you need to go further afield.Would definately use this apartment again. Only real issue is that apartment has to be paid in cash on arrival.This is a worry to carry so much cash around.Otherwise fantastic. We have stayed for one week in the apartment with our daughter 9 years old. The apartment is fantastic. We enjoyed very much our stay. Very easy access to public transportation and shops, restaurant and supermarkets were just next door. 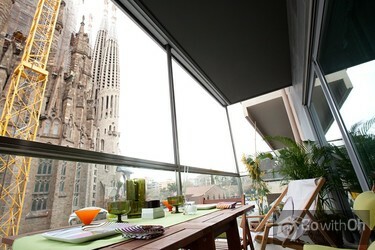 We had breakfast and dinners in the balcony and enjoyed the ...view of Sagrada Familia. The apartment is just as shown in the photos.Thank you S. We felt like home and would come back to this apartment next time in Barcelona. We were 4 girls who stayed July 8-12 and had a wonderful time in the flat. There were train options on both blocks opposite of one another for easy commutes to just about anywhere in the city. Flat looks exactly like photos. Clean, beautiful kitchen, comfy beds/pillows, no noise even though it's ...literally across the street from La Sagrada Família (gorgeous view). A great choice and would definitely consider staying here again. Le seul petit détail: la cafetière ne fonctionne plus. Heureusement, il y a des cafés au rez-de-chaussée. La ponctualité de la personne d'accueil le jour de la remise des clés et la propreté de l'appartement. Wir empfehlen diese Wohnung uneingeschränkt weiter, sie ist tatsächlich genauso schön wie auf den Fotos und wir haben uns sehr wohl gefühlt. Appartement idéalement situé, joliment aménagé, agréable à vivre. Très propre et bien entretenu. Tout parfait pour passer un séjour de découvertes à Barcelone. Es war toll und hat super geklappt! Estupendo, llegamos un poco tarde y JL nos espero y fue muy amable con nosotros y no le importo el retraso. Apartamento muy cómodo que te hace sentir como en casa. Location conforme en tout point de vue des photos du descriptif et de ces commentaires positifs. Situation idéale (transport en commun) et vue imprenable de la Sagrada Familia. Je recommande aussi Parclick Sagrada Familia parking compétitif et sécurisé pour la voiture, proche de l'appartement. A refaire et à recommander. Great location:Sagrada familia with surrounding small parks, streets to walk, supermarket, bakery, metro, taxi station, bus touristic, tourist information booth. Restaurants of any kind: la paradeta, Babilonia (also fast food Mac, KFC)20 minutes walk to market La Concepcio, as well as Gaudi ...buildings La Pedrera and Casa Batlo, boulevard passeig de Gracia.Architecture complex Hospital Sant Pau - in the walking distance.Apartments:Restful, great balcony view. Everything inside is in the excellent condition. Feeling very safe in apartments and area. Pretty silent at night.Strongly recommend! El apartamento es un auténtico lujo y el propietario se portó de forma excelente. Esperemos volver pronto. Ha sido un viaje fantástico el apartamento es perfecto y el trato muy bueno, nos hemos encontrado como en casa. Es war wirklich toll und einwandfrei sauber. Auch die Übergabe hat problemlos geklappt, wir können die Wohnung nur empfehlen! This location is perfect if you believe that the Sagrada Familia construction is a miracle in progress. You must be okay with daytime construction noise as you are LITERALLY across the street from the PRAISE AND GLORY chapel currently under construction. We were met on time by agent very knowledge... of general area. This was perfect for us. Metro stop is 15 yards from front door. We did laundry and hung clothes to dry outside. Cab to airport early AM was about 35 euros. Great final stop on our journey. Nette, zentral gelegene Ferienwohnung. Durch die Nähe zur Sagrada Famillia muss man jedoch auch mit Baustellenlärm rechnen. Amazing location! The owner is very kind and helped a lot with very useful information about the city. It will be really good to have a blender or food processor. But overall, loved it! Many thanks! Très bien situé. Grande propreté et excellent équipement. Lits confortables. Petit désagrément: les oiseaux du voisin et sa musique quelquefois trop forte sont incommodants. Séjour somme toute agréable. 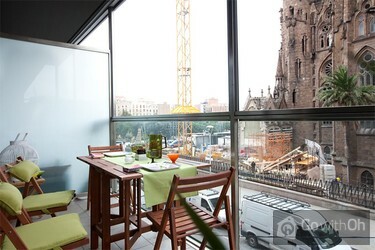 Top-Lage: Balkon mit dirktem Blick auf die Sagrada Familia! geräumiges Wohnzimmer plus 2 Schlafzimmer, gutes WLAN, moderne Küche (leider zuwenig Teller und Besteck für 4 Personen), Klimaanlage (Lüftungsschlitze leider alle verschimmelt). ottimo appartamento ed accoglienza,ottima posizione.non possiamo trovare nulla di negativo per questo appartamento,lo consiglio a tutti. Très bien, appartement propre, la personne de contact était ponctuelle et nous a tout expliqué. 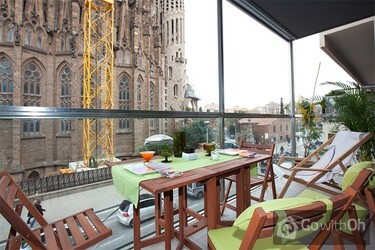 Great location and cozy apartment.You enjoy fantastic views of Sagrada Familia everyday! Unfortunately the lady on the adjoining balcony objects rather fiercely to people in the rented flat sitting chatting at night. Pity really as this is an excellent property. I pity the future residents to this apartment. Lovely apartment with stunning views. Our family felt very at home here and was very glad of the air conditioning. Facilities and equipment were great. There was a lovely bakery next door - very convenient for breakfast on the balcony! There were many restaurants around also. Good metro links just ...at the end of the street. Our kids were happy with the Wifi connection which meant that the could continue to play Pokemon Go whilst in Barcelona! The only suggestion I might make would be to have a less sheer curtain in the main bedroom as the sun came streaming in very early in the morning. Would recommend. We were met at the apartment when we arrived. We also given suggestions of where to eat and local supermarkets.